Bath e Stonehenge são dois dos mais visitados locais, que são Patrimônio da Humanidade pela UNESCO e esta excursão de dia inteiro saindo de Oxford leva a ambos num único dia. 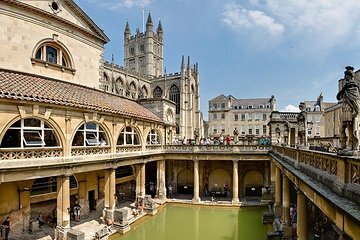 Maravilhe-se com o antigo círculo de pedras de Stonehenge; veja a Abadia de Bath, as Termas romanas, e o Centro Jane Austen em uma excursão a pé pela histórica cidade de Bath; em seguida, aproveite o tempo livre para comprar souvenirs ou delicie-se com o chá da tarde. Passe pela Victoria Art Gallery e pelo Jane Austen Centre e ganhe tempo livre para fazer compras ou almoçar. Stonehenge ist schon beeindruckend und sehenswert, allerdings leider völlig überlaufen. Bath muss man nicht unbedingt gesehen haben, meiner Meinung nach eher langweilig. Unser Guide Lana schien leider auch nicht besonders motiviert und nicht sehr gut informiert zu sein, was natürlich schade ist. Very interesting, particularly Bath. Stonehenge seemed to me a bunch of stones in the middle of nowhere, not terribly exciting. The tour guide Sam was excellent, very professional and kind. The guide was incredible. He was very knowledgeable about both areas and the history behind those areas. He also pointed out interesting things on the bus trip. I thought that we stayed a little long in Stonehenge and would have preferred a little extra time at Bath but it was a beautiful day!